Funeral arrangements are highly personal. Some choose a basic funeral whilst others prefer a more elaborate service. There is no right or wrong way and you should not feel pressured in the choice you make. Whatever you choose, arranging the funeral provides an opportunity to create a unique commemoration of the deceased. 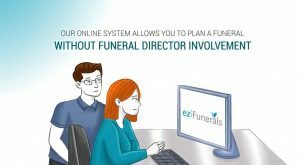 You may make funeral arrangements using eziFunerals online planning service, at the funeral home or another location, such as a solicitor’s office or friend’s home. It is possible for you to arrange the funeral yourself; this can be a complex undertaking, but also rewarding. However, some of the tasks involved in arranging a funeral may be distressing and it is not advisable to try to do it all yourself. Ask another family member or friend for help or alternatively use the services of eziFunerals who can connect you with the right funeral director.